One of the big unexplained assumptions in the government’s recently announced promotion of a stronger role for Australia in the weapons industry is that the interests of the industry are completely aligned with Australia’s national interests. In effect our prosperity is to become even more dependent on the industry that relies on wars and threats of wars for its survival. If, on the other hand, we still have any pretence to promoting peace and stability in the world – admittedly a big “if”, given our roles in the destabilising of the Middle East – then the government’s recent announcement runs completely counter to that purpose. Why would we advocate for arms restraint and peaceful conflict resolution when those things undermine the very market for the products we’re trying to sell? Beef producers generally don’t promote vegetarianism. In an attempt to normalise the notion of war profiteering, or at least distract the voter from its seedy reality, the PM’s announcement focussed heavily on the jobs that would be created. Herein lies a further unexplained assumption: that weapons projects are the best way to create jobs. With an expenditure of $3.8 billion for a weapons financing facility, most of us could guess that there would be some jobs in there somewhere. 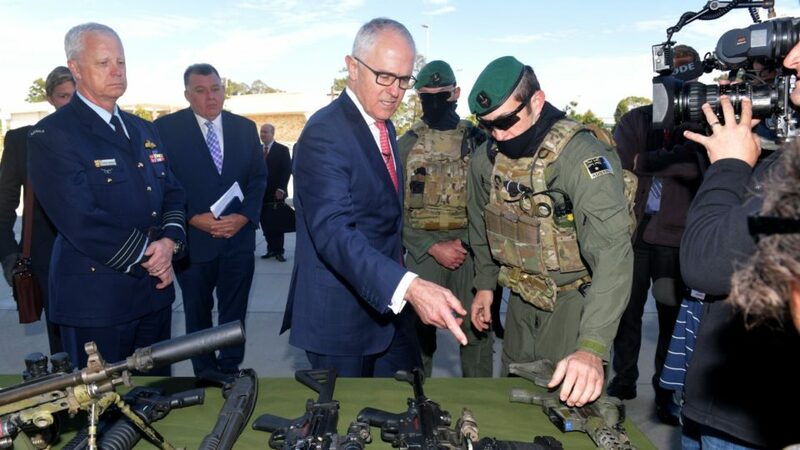 But what Turnbull has completely avoided is the question of whether that money spent in other ways could create far more jobs, with the added bonus of not pushing Australia further into the murky world of the arms trade and all its associated ethical and strategic dilemmas. Where are the data indicating that $3.8 billion to help the weapons industry will create more jobs than the same investment in, say, health or education or renewable energies or public transport? The figures don’t exist, of course. Research comparing the costs of providing jobs in different sectors is sadly neglected in Australia, probably non-existent. (The author has looked and found zilch.) This is a big gap that needs filling, if only to counter the recurrent mantra of “jobs” that accompanies every shuffling of our tax dollars away from where they are really needed. The additional jobs in clean energy, health care or education were across all pay ranges, including mid- and high-paying jobs. Unlike other jobs, military jobs are generally in large identifiable locations that can be directly linked to a parliamentary decision; that is, they are politically attractive. Other jobs are less visible and more widely dispersed, and their advocates lack the huge lobbying resources of large weapons manufacturers. Although Hartung was referring to the Raptor F-22 in this instance, the F-35 Joint Strike Fighter also springs to mind, as does Australia’s controversial submarine project. Meanwhile, as we set about boosting our weapons exports, Australia has passed up the opportunity to be a world leader in renewable energy, a sector that is playing an essential role in addressing climate disruption and the devastation it is already causing in communities around the globe. Having also slashed our overseas aid mercilessly, we will not even be assisting those most vulnerable to any significant extent, but simply profiting from the tensions and wars that follow. Most of the climate refugees, along with those from the wars we fuel, can of course forget about coming here. Our PM’s vision for Australia’s place in the world is mean and adversarial. His excitement at the prospect of Australia being a leader in death and destruction is degrading and sells short our enormous potential to be a force for good in the world. Dr Sue Wareham OAM is the President of the Medical Association for Prevention of War (Australia). This article is based on a letter first published in The Canberra Times on 30 January. Published by johnmenadue.com Pearls and Irritations.